Our French Alps Brass Shelf and Wall Lamp is OUT OF STOCK, but we have ordered more! You are still able to purchase it now and we will ship it to you as soon as it arrives. Questions? Please call 1-800-438-5346 or email us at info@Lehmans.com. Handmade in the French Alps by the same family continuously since 1869 using tools powered by a 19th century water wheel. Proven in harsh primitive and marine applications. Burns kerosene or lamp oil. Our most versatile. Use it on tables, shelves, or mount on wall. "Tip-proof" weighted base, bright #14 burner. 16 oz capacity, 10 hr burn time. I have been waiting for this lamp I ordered over a year ago. 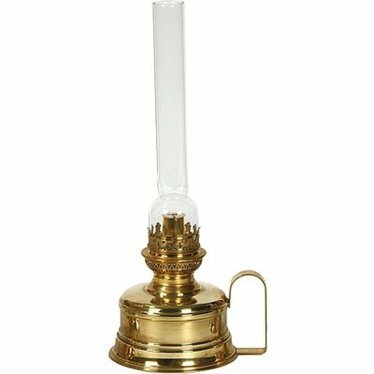 I'm surprised, given my conversations with Lehman's, that, not only are they still offering this lamp which they do not have in stock, but they have increased the price for this possibly non-existent lamp. I'm sure I would love it if I ever got it. Lehman's says: We appreciate your patience! It is a beautiful lamp and we are certain you'll love it. Despite the vendor's difficulties, we truly believe that this lamp is worth the wait! As promised, once we have inventory we will ship your order out as soon as possible. I just received the lamp, which was shipped promptly and very well packaged. The lamp is lovely, well constructed, and I can't wait to light. Thanks for the good service, I will buy again from Lehman's. We bought this a year ago for our small (non-electric) cabin and love it. It is very stable on the wall, easy to hang, easy to fill, and puts out a lot of light. It is also very attractive and well made. We're buying another one. I have been living without electricity for three years now and this is my favorite lamp. It is surely the best of the wick lamps. It puts out almost as much light as the mantle lamps and is much less finicky. It is light weight and easy to carry; it can sit on the table or hang on the wall, where it can be moved around to any available nail. I use kerosene in it. I love this lamp and would recommend it over all others.